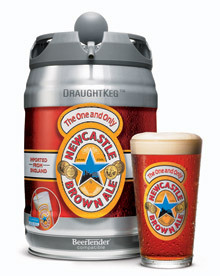 Newcastle Brown Ale has announced the launch of the Newcastle DraughtKeg. It uses the same technology originally created by Heineken USA, aimed to provide freshness and portability through a pressurized draft system that utilizes a patented internal CO2 system with a mini tap. This feature is intended to keep the beer fresh for up to 30 days after tapping and delivers the same taste experience as a pint of Newcastle poured in a pub. The kegs holds 1.33 gallons (5 liters) of Newcastle, about 10 pints of beer. The Newcastle DraughtKeg is also compatible with the Krups BeerTender, an appliance designed exclusively for the DraughtKeg. Anyone know of a hack to reuse these mini kegs and refill them with homebrew? Is they a new summer ale newcastle?